Plus: your basic rights at work, pensions 'sell out', letters, international round up and much more. Download as a PDF file or read online. Stop work to stop the cuts? Why striking against the cuts makes sense on June 30 and beyond. Striking back: In-depth centrefold feature on strike action, including an illustrated timeline of strikes in Britain and a graph plotting falling strike days against rising inequality. Victory against Office Angels: Direct action solidarity wins a temp's stolen wages. This year's war: From Iraq to Libya - where there's oil there's 'humanitarian intervention'. Winning the argument or winning the fight: where next after March 26? Austerity Britain: centrefold feature on austerity and the resistance. Levenshulme Baths saved: 20-day campaign gets results. North African revolts: calls for 'bread and freedom' spread. Know your rights: basic rights at work. Actions speaks louder: Did the trashing of Tory HQ at Millbank in November mark the start of a militant anti-cuts movment? Direct Action: Centrefold poster to pull-out and keep - or decorate your local occupation with! Housing benefit cuts spark poverty fears: We interview a claimant. 'All joined up': An interview with a French teacher who participated in the general strike and economic blockades there. NOT all in this together : The Government’s “tough but fair” budget will hit the poorest the hardest, as well as having a disproportionate impact on women. Meanwhile, the Sunday Times Richlist reveals that the richest 1,000 people in Britain added 30% to their wealth despite the recession. Is this farewell, welfare? : The government’s answer to the problem of unemployment during the biggest economic crisis since the 1930s is not to create any new jobs, but to launch a massive attack on our living standards. In this issue: Vote for change? ; Battleground higher education; Climate change; Net pirates, Know your rights and more! In this issue: Crisis, cuts and class struggle; Interview with a Tower Hamlets College striker; Cleaners struggles; Lewisham Bridge school occupation, Know Your Rights and more! Sweep ISS out of SOAS : Victimisation of cleaners at a major London university is fought by students and workers. Victory at Linamar: After threatening strike action, workers at the car-part manufacturer Linamar succeed in getting a Unite convenor re-instated. Tube staff go off the rails: London Underground workers take strike action to protect job security as tube bosses put 4,000 jobs at risk. Know your rights: Immigration checks The regular Catalyst column summarises our immigration rights. Occupy and win! : After they were given six minutes’ notice of the closure of the company, Workers at car parts manufacturer Visteon in Belfast, Enfield and Basildon occupied their factories on Wednesday 1st April. National Day of Action against Subway: A series Subway outlets in the UK and Ireland are picketed following the victimisation of a pregnant Subway worker in Belfast. Know your rights: Maternity Leave The regular Catalyst column at our rights when we're pregnant.Download as a PDF file or read online. Royal Mail: Unofficial action gets results. Workplace organisation at Runcorn Delivery Office reaches a new height with a 24h wild cat strike. Recognise This?! We look at new labour legislation introduced by New Labour, allowing ‘Automatic' union recognition. It's Official; poor means skint. The Acheson Report on Health Inequality from the Department for the Bleeding Obvious has new findings: apparently the poor have less money and live less well. 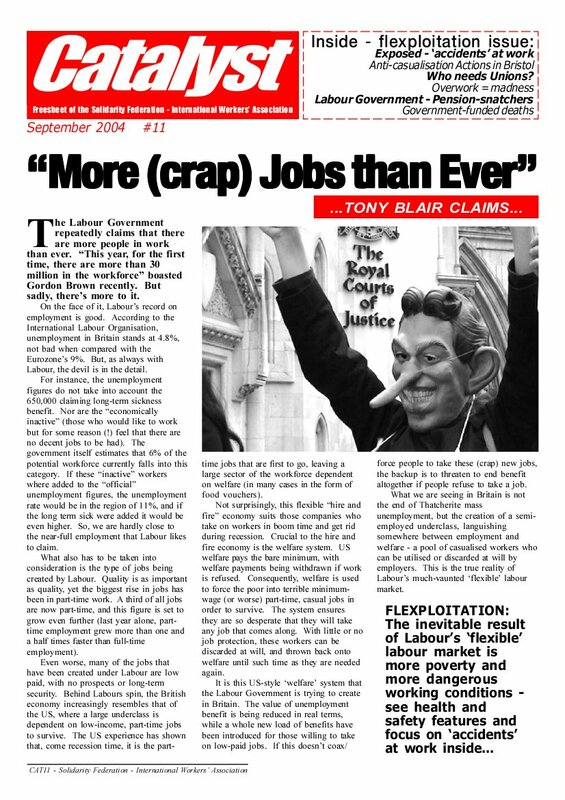 Catalyst is the quarterly freesheet of the Solidarity Federation. If you want to get hold of a copy, get in touch with your nearest SolFed local, or email catalyst[AT]solfed.org.uk. If you would like to distribute Catalyst, please get in touch with the Media Collective. Catalyst is SolFed’s main outward-looking propaganda, and is produced by the media collective as mandated by national conference. We want it to be as good as possible, and reflect both the geographical and topical scope of the organisation. But we can only print what gets submitted! You don’t have to be an experienced writer to submit to Catalyst, anything from 25 words to 1,200 words will be considered. We have tried to develop a ‘house style’ of ‘psuedo-news’, because Catalyst only comes out every 3 months we need to present analysis in an accessible newsy way. But you don’t need to worry too much about this – that’s what the collective is there for, to sub-edit or re-write sections where necessary to fit in with the overall style. Page 1: Mostly flags for what’s inside, plus the first 400 words of a lead article (which can be up to 1,000 words long if it’s continued inside). This article is usually on the most important issue that will be topical for the 3-month duration of the issue (e.g. cuts, elections etc), and is normally written or commissioned by the Catalyst collective. Page 2: International round-up. Anything from 25 word shorts to 600 word articles about international class struggles or events of interest to angry/militant/disillusioned workers. We try to get IWA stuff in, but only when it’s of interest to non-anarchists – so things like the FAU Babylon Cinema and Belgrade 6 have been covered extensively because they’re also newsworthy, but CNT actions would only be covered if significant, rather than reporting every minor dispute or bit of solidarity they do (which is quite a lot!). Page 3: the second most important page in the paper. Usually a feature article of 5-600 words, ideally on a struggle we’ve been directly involved in (such as the Lewisham Bridge school occupation), or a topic of wide interest where our anarcho-syndicalist perspective offers and angle people won’t have read elsewhere. This page also has around 400 words for other articles, plus a ‘news in brief’ column for 50-100 word shorts. Page 4-5: Centrefold spread. This is our chance to look at an issue in depth, or do an interview with a participant in a recent direct action (strike, occupation etc). Usually around 1,400 words in total, but broken into several separate pieces on the same theme. So if it was an interview, there’d also be a ‘background’ box, for example. They wouldn’t necessarily have to be written by the same person. Page 6: Industry Focus OR Know your rights. Standing feature, 8,00-1,200 words in-depth on a particular industrial focus or legal rights issue. Basic rights at work are in every issue on page 6 or 7. Page 7: Comment, Opinion & Letters.